(a) Turning tool. In capstan or turret lathe heavy duty turning tool is used which is mounted on the cross-slide or knee holder. Knife edged bar turning tool, which may be mounted on the box tool holder or on the cross-slide tool post. Another special type of turning tool used in capstan and turret lathe is a hollow mill. Figure below shows three teeth on the hollow mill are provided with cutting edges. The tool is hollow, through which portion of the job which has been machined passes through. The tool itself guides the work and prevents it from bending. This type of tool is suitable for turning smaller diameter of brass or steel. The chief disadvantage of using this type of tool is the difficulty in regrinding. Moreover, each regrind changes the diameter of the work being machined. 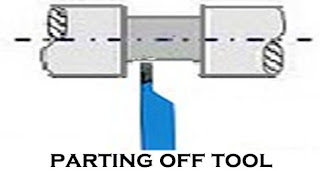 (b) Facing tool - Figure below shows a facing tool. The rake is provided in different directions for turning or facing operations. The tool may be mounted on the cross-slide or on the knee tool holder. (c) Parting off tool - Figure below shows a parting off tool. All round clearance is given on the tool to clear the work while cutting. The tool is usually mounted on the rear tool post. (d) Grooving or Recessing Tool - Figure below illustrates a Grooving or recessing tool. It is used for producing groove or recess on the surface of the job. (e) Boring Tool - The boring tools mounted on boring bars are used for enlarging a hole in a capstan or turret lathe. (i) Chasers - All self opening die holders are fitted with four chasers for cutting a thread. (ii) Single point tools - Single point tool is used for cutting thread on work having larger bore diameter in a manner similar to centre lathe. Taper turning on capstan and turret lathe is carried out either by forming tool or by taper turning attachment. Short tapers can be carried out by specially made forming tool. Angle of the tool is made as per the taper angle to be turned. Taper turning attachment is used for longer taper. 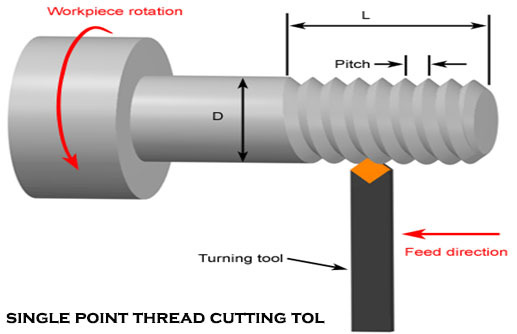 Taper turning attachment of capstan and turret lathe is same as taper turning attachment of center lathe in respect of functions and construction.